I’ll admit that I’m among the thousands of people who have an infatuation with Everest. The infatuation began sometime during early high school and has continued throughout my life. I’ve read books, magazine articles, blogs, and have watched countless movies. I’m an Everest fanatic. Everest North Face toward Base Camp Tibet, 2006. Photo courtesy of Luca Galuzzi, Wikipedia. It’s not that I actually want to climb the highest mountain in the world. No, not for me. But, there’s just something about the lore of this mountain. The stories of triumphs and failures, of life and death, and the mystery of who really got there first – Hillary/Tenzing Norgay or Mallory/Irvine…. What really happened to Mallory and Irvine anyway? The finding of Mallory’s body in 1999 answered a few questions but left a lot unanswered. There’s the missing picture of Mallory’s wife and the missing camera, not to mention the missing Irvine himself. Then there’s the ski history. Many may have watched Yuichiro Miura, from Japan, ski off of the top of the Lhotse face in the 1970’s movie The Man Who Skied Down Everest. While Miura’s attempts were admirable, he still did not ski from even close to the summit. In 1996, the record year of death’s on Everest and the season that prompted Krakauer’s book Into Thin Air, Hans Kammerlander gave the peak another shot with the skis. He skied the north side, but was unable to claim a true summit ski. Everest’s first uninterrupted summit ski did not come until 2000, when Davo Karnicar showed everyone that skiing from the world’s highest peak was indeed possible. 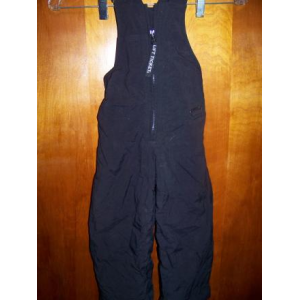 Also in 2006, Kit DesLauriers was the first women to ski Everest. Since then, it seems that skiers everywhere are jumping on the Everest bandwagon, including Davenport and even Telluride’s Hillaree O’Neill. But, today we are not here to talk about the skiing on Everest. We are here to talk about the climbing. This season was brutal on climbers, with conditions more icy than usual and only a couple of true weather windows to allow enough time for an ascent. Because of the weather, Everest climbers were generally forced into one of two windows, increasing the unsafe crowds that has plagued Everest in the last 20 years or so, resulting in 11 north side deaths – the most since 1996. 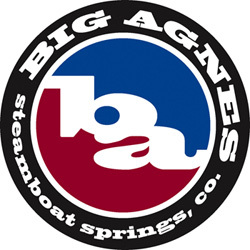 Alan Arnette has a great recap of the 2012 season on his blog. I recently had the opportunity to interview Rob Cassady, a former coworker of mine who climbed Everest this past season. Rob and I taught science together at Standley Lake High School in Westminster, CO for a number of years before I made the move to Crested Butte. As I grew into a ski mountaineer, Rob and I chatted often about various peaks and lines and mountaineering dreams. I never really knew that Everest was in his plan. But, it was. 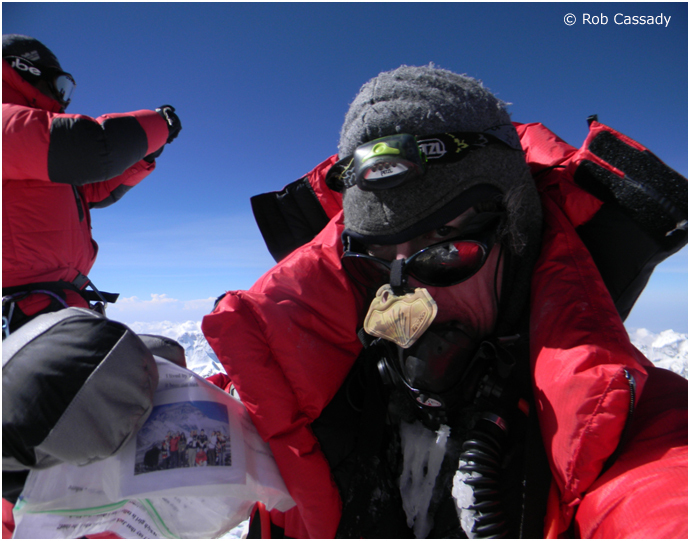 Rob went to Everest with his mountaineering friend, Jeff Reynolds. Instead of using a commercial agency, they climbed through a nonprofit group, S2 Mountaineering, that Jeff and a couple others had set up. This helped to keep the exorbitant costs of climbing Everest down. In Nepal, they worked through Windhorse Adventures. Rob’s expedition had 4 climbers and 3 Sherpas. The climbed via the south side and all seven made the summit! When did you decide you wanted to climb Everest? 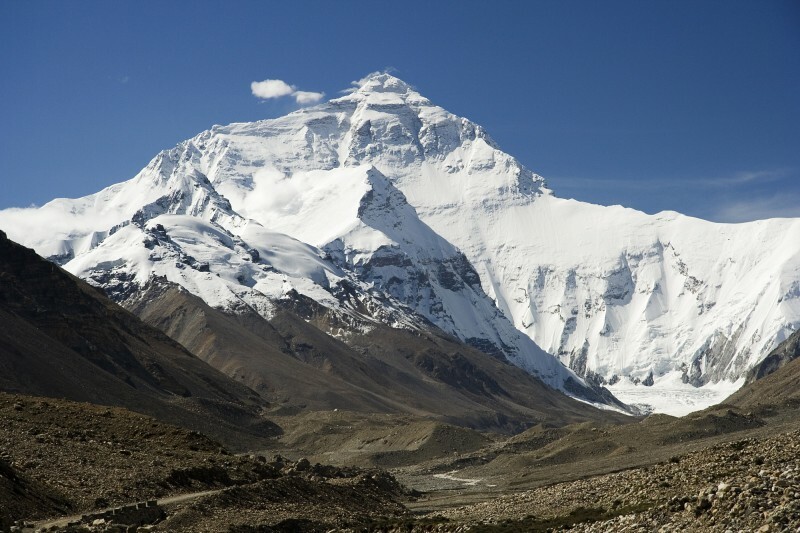 Climbing Mount Everest has always been on the back of my mind since as a kid I read the 1963 National Geographic article of its first American ascent. Two years ago, Jeff Reynolds invited me to Everest after an expedition to Papua. Although I immediately answered ‘No,’ I’m getting older, my kids are going to be in college soon, teaching jobs in Colorado are in a state of flux, and given that the expedition was with someone I climbed well with, I signed on. An important omen was when I landed on the “Climb Mt.  Everest” square when I played a game of Life with my daughter. I never land on that square. When you first talked to your family about seriously climbing Everest, what were their reactions? How did they support you through your adventure? Julie, my wife, was very supportive and never said that I shouldn’t go despite her concerns for my safety and sanity. My parents were initially noncommittal, then told me not to go, then gave me encouragement in the weeks before my departure. I could not have made the climb without Julie. She took care of our two kids, and earned money while I was frolicking. I can’t thank her enough. What did you do to train for climbing Everest? My training was centered almost entirely on strength and cardiovascular fitness. I hiked in the mountains west of Boulder almost every weekend for the 4 months prior to the trip. Every other week I would do a long hike of 25 to 30 miles, involving 9,000 feet or so of elevation gain. At least once a week, I climbed stairs on a machine at the Louisville Recreation Center for far too long. I also swam once a week and did sit-ups and pull-ups every other day. When did you leave for Kathmandu? How many days were you there and what did you do there? I left for Kathmandu on March 23rd and returned on the 3rd of June, for a total of about 70 days. In Kathmandu, I visited Durbar Square and Swayambhunath (the monkey) Temple. The poverty in portions of the city is quite severe… My cheap duffle bag also broke en route so I also had to buy sunscreen. A temple at Durbar Square in Kathmandu, Nepal. Tell us about the journey from Kathmandu to base camp. It was beautiful but also daunting. Each day we went higher into less hospitable lands, knowing that it would be two months before returning. I remember passing a herder wearing sweeping robes with only a narrow slit for her eyes one afternoon as mists swirled past us. It seemed as if I could have just as easily been on some icy version of Tatooine. What was base camp like? Did you meet anyone interesting? About how many days did you spent there total? Base camp is on the glacier itself and the ice is always creaking and making noise below you as you sleep. There are lots of yaks and such passing by, and we would hear the crack of an avalanche every hour or so. I spent the better part of our 40 days there staring at the ceiling of my tent. We had 5 movies loaded on an IPAD so I am quite familiar with “Hot Rod” and “Nacho Libre” at this point. Our camp was right next to the people who maintain the Icefall who are known as the “Icefall Doctors”. A special experience was spending an afternoon with a couple of these doctors, one of whom had been working the Icefall since the mid 1970’s. He might be the most experienced mountaineer in the world and almost no one even knows that he exists. 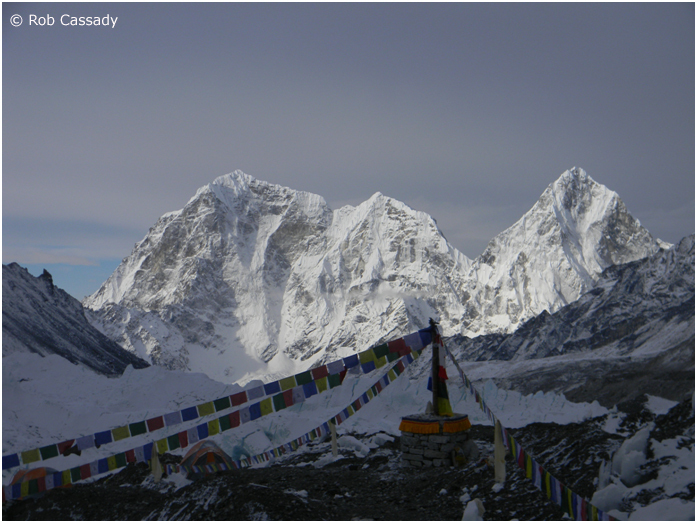 Taboche and Cholatse from Base Camp. 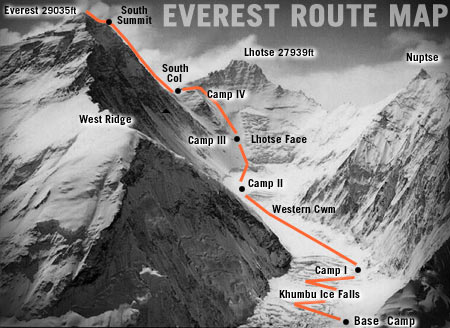 The South Col route involves first climbing the Khumbu Icefall from Base Camp at 17,600 feet to Camp 1 at 19,000 feet. There is then a walk up a valley known as the Western Cwm to Camp 2 at 21,300 feet. Shortly above this is the 5000 foot Lhotse face with Camp 3 half way up at 23.500 feet. 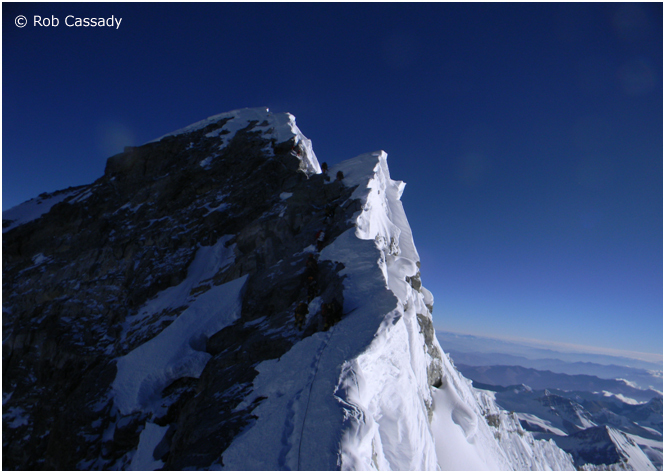 Climbers then reach a saddle known as the South Col between Mt. Everest and Lhotse at about 26,000 feet. From here, the route climbs 1500 feet up shallow gullies to a ridge which goes up past the South Summit at 28,700 feet to the summit. In this last stretch is a feature known as the Hillary Step which is a short rock climb. 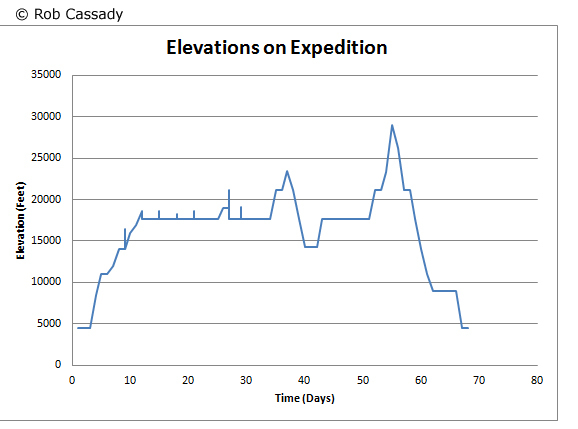 Acclimatization elevations on Rob Cassady's Everest Expedition. After the slow ascent to Base Camp, I spent over two weeks there before our first rotation onto the mountain. We made three round trips onto the mountain, the first reaching Camp 2, the second sleeping at camp 3, and the third to the summit. On the latter two trips, we spent a full day at Camp 2 before proceeding higher. We also made several day trips to Kala Pattar and the base of the climbing on a nearby peak known as Pumori. View from Camp 3 down the Lhotse Face and Western Cwm to Pumori. How did your body deal with the altitude? How did entering “the death zone” make you feel physically and mentally? I had some trouble with the altitude. Even though I was in good shape, my body definitely wasn’t thrilled with going to where the air was so thin. Descending from the summit down to Camp 2 was exhausting and I generally stopped at the end of each fixed rope and rested before proceeding. I felt like I was thinking clearly, although my wife says that I mix up more words now than I did before the trip. Describe your summit day. How did it feel to finally reach the summit of the world’s highest peak in one of the most difficult years on record? The summit day was a continuation of the day reaching the South Col. We had been caught behind many people in the climb to the Col, and spent less than three hours hydrating and eating before leaving for the summit. Jeff described the climbing as a very dangerous Disney ride, where we were following fixed lines with climbers both in front and behind us. Below the South Summit, the line stopped for at least half an hour apparently because someone didn’t know how to rock climb wearing crampons. Once at the South Summit, the climb was surreal, with the rising sun and the famous summit ridge above and nothing else around us but wind and sky. The summit was a gaggle of people from both the north and south. There was a narrow level ridge with a pile of prayer flags at one end and the Earth dropping away in every direction. I felt a sense of satisfaction, but then again it is just a very big mound of rock and snow. After about 10 minutes, Nima, one of our Sherpas, changed my oxygen bottle and I began the descent. There was an hour wait at the Hillary Step due to people still coming up, and my oxygen stopped flowing until Nima again changed the tank. Shortly after I got off the ridge, the wind picked up and those still up high began running into problems. View towards the summit from just beyond the South Summit. Rob Cassady on the summit with a picture of the Standley Lake Science Department. 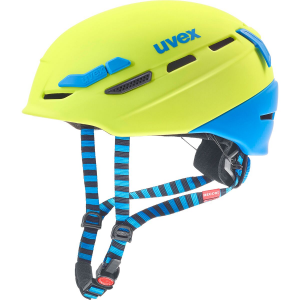 How was the descent after your summit day? How long did it take you do return to base camp? One of our group had fallen near Camp 4 and so the following day, I ended up taking quite a bit of stuff for the descent. Others in the expedition helped him down the Lhotse Face for two days to where he could be rescued by a helicopter. Jeff and I reached base camp on the morning of the 22nd, a day later than most of the people who had summitted on the 19th. 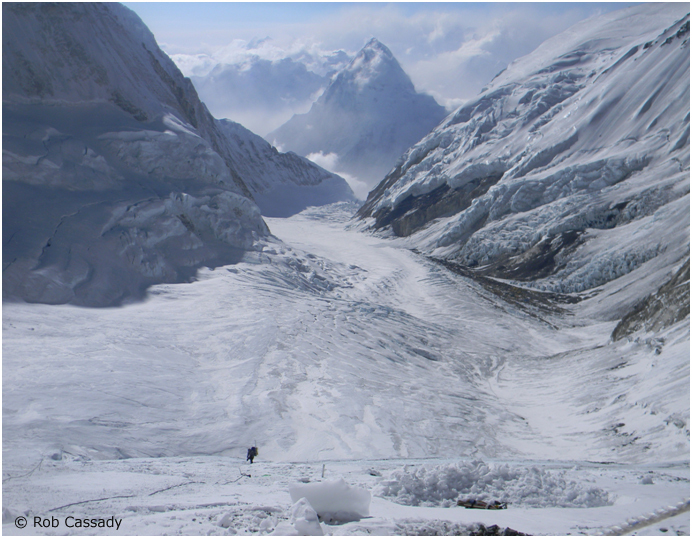 About the best moment of the expedition was clearing the Khumbu Icefall for the final time. View towards Lhotse from just below the summit on the descent. There were a lot of deaths on Everest this year. How do you think they could have been minimized or prevented? – If the fixing of ropes was coordinated in the manner of that seen in the icefall, rather than relying upon the collaboration of disparate groups the task would have been more efficient and there would have been several earlier summit days rather than a huge rush on the 19th. 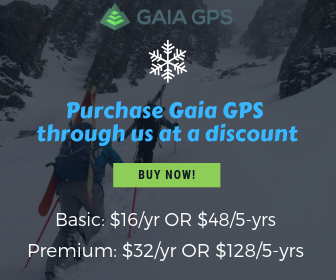 – Ironically, climbing Everest requires money but not necessarily extensive mountaineering experience. There were climbers who were not comfortable climbing rock in crampons which resulted in long waits as they struggled on technically easy ground… They should not have been on the mountain. – A second fixed rope for descent directly on the fall line of Hillary’s Step would have saved at least an hour of time for most climbers on the 19th. – At least one climber died as a result of failing to turn around when their turn-around time had been reached. 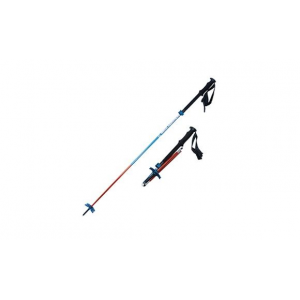 – Always clipping safety lines while crossing crevasses would have saved one person’s life. Tom Burton crosses a crevasse at the top of the Khumbu Icefall. Were you able to stay in touch with your family while on Everest? How? How often? I contacted my family about every 2 weeks either by email or satellite phone. It is currently possible to send emails from Gorka Shep which is about an hour’s hike from base camp. In addition, Jeff sent detailed expedition updates every couple weeks. 14erskiers Note: Dispatches can be seen here. What was it like to return to “the real world” after spending so much time in the Himalayas? I found it interesting that I didn’t see any news for two months, but the headlines were really no different than when I left. The Republicans and Democrats are still squabbling and the violence in the Mideast continues. Being a teacher, I really haven’t returned to the real world because I returned only three days into summer vacation. In retrospect, is there anything you would change about your Everest experience? I wouldn’t have worn “Toasty Toes” on summit day. My feet were a bit squeezed by them and I got some frostbite. 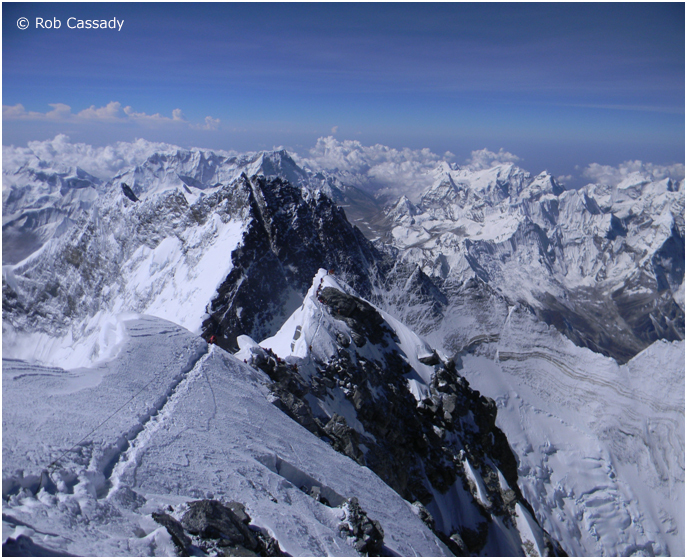 How does Everest compare to other peaks you’ve climbed throughout the world? As Jeff said, climbing one of the trade routes on Everest is a bit like a dangerous Disney ride. It’s amazingly beautiful and one of the most difficult things that I’ve ever done, but barely mountaineering. It was crowded and there seemed to be a lot of politics involved but all the same it is Everest and unforgettable. In 1993 I climbed Cholatse which was much more of a mountaineering experience with us leading and putting in anchors and such. In a way there were similarities to the Nose on El Capitan (which also has crowds and fixed anchors). 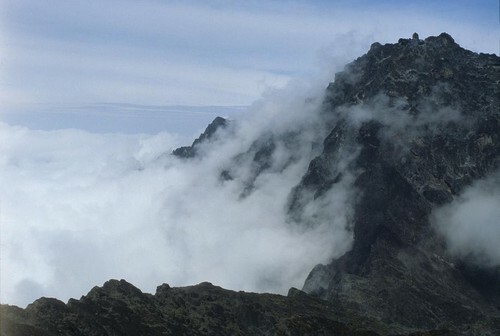 In reality, I generally favor more obscure objectives like those in the Rwenzori Mountains of Uganda, or something like Valhalla Peak here in Colorado. Having run the Hardrock 100 race was a huge mental benefit on the summit push. The mentality is similar only more serious on Everest. 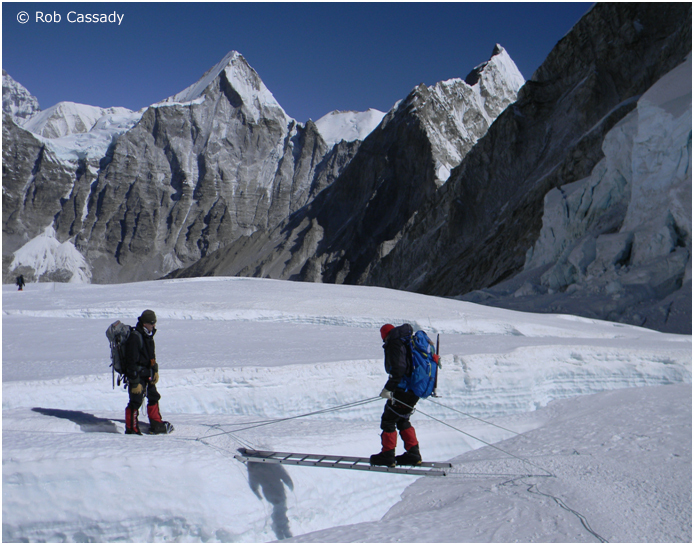 What were some of the greatest challenges you faced during your overall Everest experience? The greatest challenge was maintaining motivation to enter the Icefall and the dangerous regions above after so long at the mountain. What were some of the greatest rewards of your overall Everest experience? To me, this was the culmination of thirty years of mountaineering. It is something I would have regretted never doing when older. Climbing with the other expedition members was great. They are all great people. Now, I would like to spend more time with family and friends. Is there anything else I’m missing? Anything you’d like to add? Our climb would have been much harder without the help of our Sherpa. They are amazing. The peak is dangerous, and in many ways a kind of silly objective. Two of our camps were destroyed by avalanches, rocks whizzed past us on the Lhotse Face, and many people died on our summit day. It’s Everest though, so it’s much easier to say be safe and don’t try it after returning. Just being Everest, it will always draw the attention of many for its challenge and beauties. Many thanks to Rob for his thoughtful responses, photo contributions, and time! While doing my research to write this article, I came across a number of interesting sites and videos, some of which I have linked within the text above. Below are some others that I truly enjoyed, but are not linked above. Great article on Rob Cassidy and his climb! Do you happen to know how I could contact Rob? I would like to get permission to use one of his photos. Any help you can provide would be greatly appreciated. It was really nice article and useful interview of Rob Cassidy. It was very adventurous journey and experiece of Rob.. Glad u shared it.